An ultrasensitive sandwich-type electrochemical immunosensor was developed for the amperometric determination of serum myeloperoxidase (MPO). 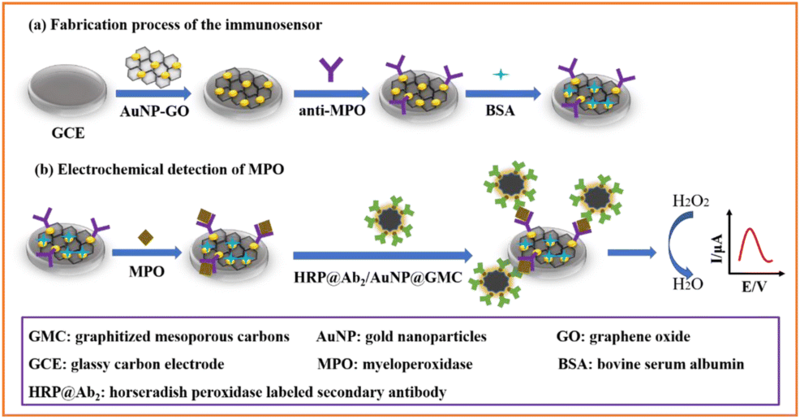 The method is making use of (a) gold nanoparticles encapsulated in graphitized mesoporous carbons (AuNP@GMC); and (b) horseradish peroxidase (HRP) labeled secondary antibody (HRP@Ab2) immobilized on AuNP@GMC. MPO capture antibody (Ab1) was immobilized on the electrode modified with an AuNP-graphene oxide nanocomposite. The sandwich immunoreaction leads to the formation of the complex composed of Ab1, MPO, and HRP@Ab2. An amplified electrochemical signal is produced by electrocatalytic reduction of H2O2 (at a typical voltage of −0.18 V vs. Ag/AgCl) in the presence of enzymatically oxidized thionine. The peak current of thionine was measured using differential pulse voltammetry. Under optimized steady-state conditions, the reduction peak increases in the 1 to 300 pg.mL−1 MPO concentration range, and the detection limit is 0.1 pg.mL−1 (at S/N = 3). Bei Liu and Lingsong Lu contributed equally to this work. 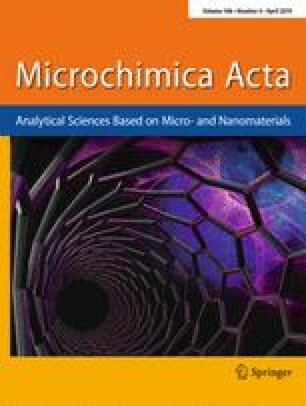 The online version of this article ( https://doi.org/10.1007/s00604-019-3359-z) contains supplementary material, which is available to authorized users. This work was financially supported by Medical Scientific Research Foundation of Zhejiang Province (2018PY022 and 2017PY024), Public Welfare from Science and Technology Department of Zhejiang Province (2017C33201), Zhejiang Provincial Natural Science Foundation of China (LQ19H090019) and the National Natural Science Foundation of China (81301514).